5. Big Enough to fit IPHONE8 (without case). 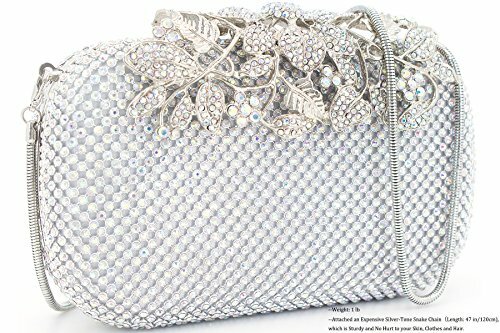 ☻ Material--This women evening bag is made of AB rhinestone A, which is very sparkly like a diamond, no blemishes. Our silver metal frame is no scratch, no bubble, no rust on surface. Smooth Silk Satin Lining. ☻ Dimension-- Approx 6.5(L) x 2.17(W) x 4(H) inches. Round rectangle box shape with nice crystal floral clasp. This women clutch just fit iphone7 (not plus and without case) or cards, cash, lipstick, key.